With a "Tiny IPA", American Pale Ale and New World IPA in its lineup, Cheltenham brewpub Bad Shepherd was already offering plenty for the hopheads out there. But clearly it wasn't enough to satisfy co-owner and head brewer Dereck Hales (a man whose Twitter handle includes the word hophead). So he's decided to add an imperial IPA just to be safe. 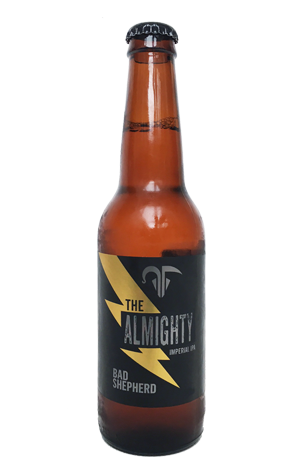 The Almighty is his latest seasonal and one that comes with suitably eye-catching packaging: there's a bold gold lightning bolt slashed across the black label that, if you look closely enough, has put paid to a sheep. The beer itself climbs close to 10 percent in alcohol and claims a whopping 100 IBU [international Bitterness Units], getting to that point by amassing a roll call of US hops – Chinook, Centennial, Mosaic, Citra, Columbus, Simcoe, Crystal and Warrior. The result is a more streamlined hop profile – intense US style citrus and pine (with a dash of what's sometimes affectionately referred to as "cat piss" aroma) – than the New World IPA (which showcases a diverse array of varieties from all over the globe). The beer's bitterness – despite the greater amount of hops used – is more contained here too, reined in by more malt sweetness and booze. But that doesn't mean you should treat the Almighty lightly.